Since it is April 15th, aka Tax Day, I thought it only fitting to talk about taxes. I’m not really the one that is responsible for the taxes in our home. OK OK…I’m totally not the one who is responsible for the taxes in our home. In fact, I don’t even think I know how to do the taxes. However, I do know how to travel. And traveling with kids has the possibility of being taxing. How’s that for a tie in? I’m smooth like butter. Am I right or am I right? All right, all right, all right…I’ll get on with it. I love to travel. I think it is safe to say that my husband loves to travel as long as it doesn’t center around huge crowds and crazy lines. 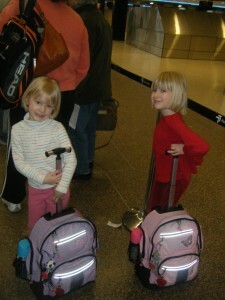 And I am happy to say that we are raising two little girls who love to travel. Granted they are not up to Jolie-Pitt Clan standards, but we’ve made our mark in a quite a few places. It helps that both our families live out of state (Maine and Montana) and in order to see Grammy KK or Nana and Papa we have to hop a train, plane, or automobile. As a family we have conquered New England, Chicago, parts of the Pacific Coast, Hawaii, the I-90 corridor that stretches through Washington, Idaho, Montana, and beyond. We have had blown-out diapers at 30,000 feet, gone comando at O’Hare, experienced crying jags that have lasted for miles and miles, and had more roadside potty stops than I care to remember. But we have also had some wonderfully exciting, totally memorable times. Through all this we have learned, as parents, a very important travel lesson….ANYTHING GOES!! That would mean unlimited snacks, bribery, and hours of DVD movies. ANYTHING GOES goes a long way in saving our sanity. “What? You want to watch Barbie and the Christmas Carol for the fifth time? Be my guest!” “What? You want to eat 18 pounds of red licorice and then later puke it up in the Hawaiian bushes? Knock yourself out!” “What? You want a brand new Leapster game just because we are packing the carry on? Whatever your little heart desires sweetums!” If it keeps ’em quite and entertained, then it is cool with me. Mind you, we do not use this philosophy in our every day life, but we do when it comes to travel. As a result, we are all happier for it. Mama’s happy, Daddy’s happy, little one’s are happy, and fellow passengers are happy. Happy, happy, happy. We also never have to say, “We are never traveling again. That was a nightmare!” We have trained them well…or have they trained us? ANYTHING GOES!!! What is your favorite “traveling with kids” trick? I would love to add a few new ones to our arsenal!